Botany is the branch of biology that deals with plants. It involves the study of the structure, properties, and biochemical processes of all forms of plant life, including trees. As a branch of biology, it is also sometimes referred to as plant science(s) or plant biology. Botany covers a wide range of scientific disciplines that study the growth, reproduction, metabolism, development, diseases, and evolution of plants. Also included within its scope are plant classification and the study of plant diseases and of the interactions of plants with their physical environment. 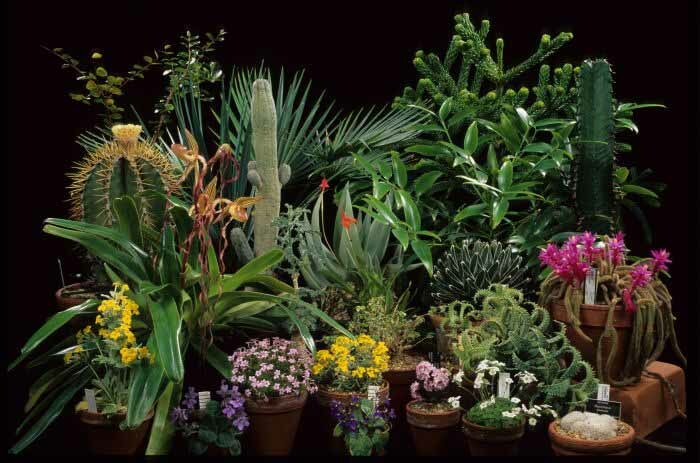 Over the years various specialized branches of botany have developed, and the principles and findings of botany, moreover, have provided the base on which depend such applied plant sciences as agriculture, horticulture, and forestry. Botany originated as Herbalism, the study and use of plants for their medicinal properties. The early recorded history of botany includes many ancient writings and plant classifications. Examples of early botanical works have been found in ancient sacred texts from India dating back to before 1100 BC, archaic Avestan writings, and works from China before it was unified in 221 BC. Modern botany traces its roots back to Ancient Greece, specifically to Theophrastus (c. 371�7 BC), a student of Aristotle who invented and described many of its principles and is widely regarded in the scientific community as the "Father of Botany".His major works, Enquiry into Plants and On the Causes of Plants, constitute the most important contributions to botanical science until the Middle Ages, almost seventeen centuries after they were written. These professionals, in seeking plants useful in medicine, began seriously to observe plants themselves, as reflected in the woodcuts with which their herbal books were illustrated. In mid-16th century, "botanical gardens" were founded in a number of Italian universities - the Padua botanical garden in 1545 is usually considered to be the first which is still in its original location. These gardens continued the practical value of earlier "physic gardens", often associated with monasteries, in which plants were cultivated for medical use. They supported the growth of botany as an academic subject. Lectures were given about the plants grown in the gardens and their medical uses demonstrated. Botanical gardens came much later to northern Europe; the first in England was the University of Oxford Botanic Garden in 1621. Throughout this period, botany remained firmly subordinate to medicine. German physician Leonhart Fuchs (1501�66) was one of "the three German fathers of botany", along with theologian Otto Brunfels (1489-1534) and physician Hieronymus Bock (1498-1554) (also called Hieronymus Tragus). Fuchs and Brunfels broke away from the tradition of copying earlier works to make original observations of their own. Bock created his own system of plant classification. Physician Valerius Cordus (1515�44) authored a botanically and pharmacologically important herbal Historia Plantarum in 1544 and a pharmacopoeia of lasting importance, the Dispensatorium in 1546. Naturalist Conrad von Gesner (1516-1565) and herbalist John Gerard (1545-c. 1611) published herbals covering the medicinal uses of plants. Naturalist Ulisse Aldrovandi (1522-1605) was considered the father of natural history, which included the study of plants. In 1665, using an early microscope, Polymath Robert Hooke discovered cells, a term he coined, in cork, and a short time later in living plant tissue. In the 17th century, as a result of the earlier revival of learning and of increased facilities for travel and study in Europe and Asia, many more plants became known, and some botanists turned from medical botany to attempts to name and catalog all known kinds of plants. In the 18th century the greatest figure in botany was the Swedish scientist Carolus Linnaeus. His most valuable and lasting contributions were his careful descriptions of approximately 6,000 species arranged in genera (the same arrangement used today), his collation of the species that he knew with the names and descriptions of previous botanists, and his rules of nomenclature. He established binomial nomenclature - i.e., the naming of each species by two words, of which the first is the name of the genus to which it belongs and the second is a qualifying word, usually an adjective (e.g., the dog rose is Rosa canina). Even in this early period, botany was becoming specialized. While many botanists were occupied only with the classes and names of plants, the foundations of anatomy, morphology, and physiology were being laid. The important field of genetics was initiated in the 19th century, principally through the work of the Austrian botanist Gregor Mendel. A "hidden cradle of plant evolution" has been uncovered in Jordan. In Permian sedimentary rocks exposed along the east coast of the Dead Sea, a team led by paleobotanists from the University of M焠ster discovered well-preserved fossils of plant groups bearing characteristics typical of younger periods of Earth history. The Permian began some 300 million years ago and ended around 250 million years ago. Researchers have discovered an internal messaging system that plants use to manage the growth and division of their cells. These growth-management processes are critical for all organisms, because without them, cells can proliferate out of control as they do in cancers and bacterial infections. Plants use this messaging system to survive under harsh conditions or to compete successfully when conditions are favorable. It tells them when to grow, when to stagnate, when to flower, and when to store resources all based on the prevailing conditions. Understanding how it all works could enable innovations in agriculture, forestry and conservation as climate change takes hold. Plants rule the planet - at least in terms of sheer mass. Many tallies of Earth's life use biodiversity as a measurement and simply count the number of species. A new census, based on biomass, compiled data from hundreds of studies to determine which kingdoms, classes and species carry the most global heft. The results show that plants (primarily those on land) account for 80 percent of the total biomass, with bacteria across all ecosystems a distant second at 15 percent. Through photosynthesis, they use sunlight and carbon dioxide to make food, belching out the oxygen that we breathe as a byproduct. This evolutionary innovation is so central to plant identity that nearly all land plants use the same pores - called stomata -to take in carbon dioxide and release oxygen. Stomata are tiny, microscopic and critical for photosynthesis. Thousands of them dot on the surface of the plants. Understanding how stomata form is critical basic information toward understanding how plants grow and produce the biomass upon which we thrive. For the first four billion years of Earth's history, our planet's continents would have been devoid of all life except microbes. All of this changed with the origin of land plants from their pond scum relatives, greening the continents and creating habitats that animals would later invade. The timing of this episode has previously relied on the oldest fossil plants which are about 420 million years old.